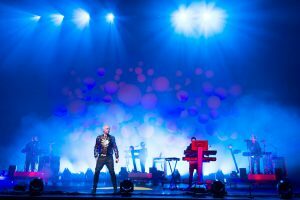 The Pet Shop Boys talk new album ‘Elysium,’ and life in L.A.
It’s got a great atmosphere. It’s electronic pop, but it’s hip-hop — there’s something really fresh about that. The link between European electro-pop and hip-hop is kind of fascinating, and that album was early on in that. It’s also very beautiful. That sounds like kind of a banal thing to say, but we wanted this album of ours to be very beautiful; we had this idea that it was going to be like a mood album, not a high-energy dance record. We also knew we wanted to have a lot of backing vocals, which we don’t normally do. And we thought we would get the right result in L.A.
Two and a half months — from the middle of January till the end of March. It was! I mean, we’ve been to L.A. so many times, but only for like a week. To me, L.A. used to be the Chateau Marmont, and that was it, really — that was Neil Tennant’s L.A. I hadn’t really got how the rest of it worked. This time we were driving around in a Mini Cooper and had a house rented above Beverly Hills with a view of the city. We sort of got to understand the logic of it. That was taken in the house we rented. He was very nice, the pool guy. Something fascinating about living there was the way people came and went in the back garden: “Oh, the pool guy’s here.” And then the gardener — he looked slightly astonished that I was talking to him. The whole rhythm of life in Beverly Hills kind of fascinated me. Every morning I’d go for a walk and the only other people walking were the dog-walkers. Actually, there was an old guy obviously walking for exercise. But really it was the dog-walkers and me. There’s something quite glamorous about being a faded celebrity, at least in London. That song actually came from here. I don’t drive a car in London, I always get taxis. And taxi drivers can be quite talkative; they often recognize me and ask about the Pet Shop Boys. So this was inspired by someone saying to me, “I quite like your early stuff.” We like confronting things you’re not meant to say — you’re not supposed to confront age in pop music. Really, a lot of the album is about what it’s like carrying on in pop music when you get to our age.